Imagine being able to cook a delicious French meal for your family and friends. Imagine being able to slice and dice like a pro and have beautiful knife cuts that would make you the next Food Network star. French cooking is one of the most delectable cooking around. Some of the most expensive restaurants in the world provide the most exquisite French dishes, and people go there just to taste the very best delicious delicacies of what French chefs have to offer. But no one simply decides that they want to have French for the night, then be able to cook it. There are many things that you have to know in order to properly cook French cuisine. The secret's out. You can actually learn to start cooking up your own French recipes at home. That is what 'Excel French Cooking' is all about. - The different terms that are used in French cooking, such as Mother Sauce and Bouquet Garni. - The different knife skills and types of cuts used by French chefs, from the brunoise to the mirepoix. - Breakfasts. You'll hear the truth about French breakfasts and the history as creator of its most famous item. - Lunches. Learn how to make French pop salads, bouillabaisse, and the well-known and irresistible soufflés and crepes. - Dinners. This discusses formal affairs and has recipes for things such as butternut squash soup, paysanne soup, and green veggie au gratin. Unlike other French cookbooks, you don't only get the recipes to make the French food that you love. You learn about the skills that French chefs have, the history of the different types of food, and much more! 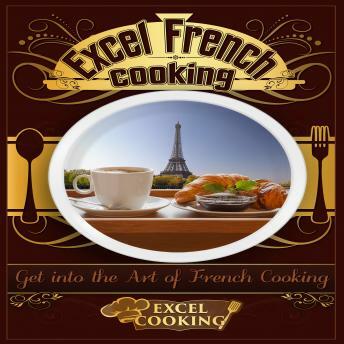 With easy-to-follow steps and a glossary of terms that you can easily understand, 'Excel French Cooking' is the book that you want if you are interested in trying French cooking and you want to impress your guests at your next dinner party.